Mirror Island is a new kind of network designed to help you get your ideas and messages out to the world as quick as possible. The best way to see how things work is by making your first post. It doesn’t really matter what you put in it for now since you can edit any post you have made, or you can delete them altogether - so have fun! 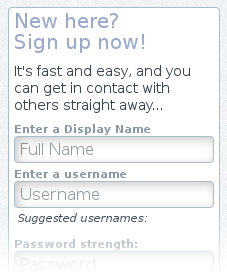 It is recommended that before making and editing posts, you can sign up for an account and sign in before continuing. As a registered user it will be easier to know which posts you have made and it enables additional features mentioned later in this quick start guide. It literally takes a few seconds, and signing in is fast too! Once you have signed in you can return here and continue on to the next section. You can sign in at any time at the top-right of any page. Near the top of the page click on New Post and the button will transform in to a new, blank document. You can now start to write your first post! The area highlighted in red is the editor window where you can type and add images. Surrounding the editor window are the editor controls. Undo and Redo: Undo (or redo) changes before saving a post. Paste Link: Turn the selected text in to a link, or if no selection has been made a copy of the address itself will be inserted and linked. Attach File or Image: Images will be displayed in the editor window. Other files will be listed below the editor window as attachments. Currently, only files up to 4MB in size are accepted. Save Post: Saves the current post and closes the editor. Cancel: Undoes all changes and closes the editor. 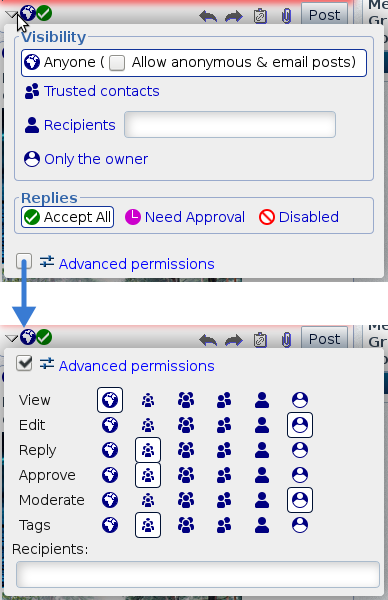 Permissions dialogue: Lets you control who can see the post. You can specify permissions when you hover the mouse pointer over the icons on the bottom left. 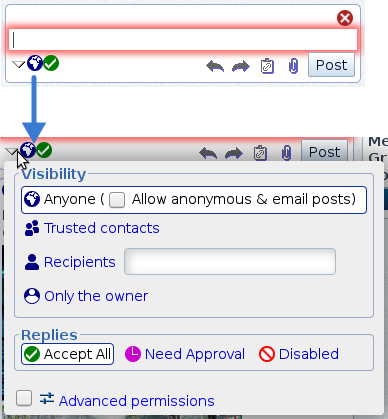 Allow anonymous & email posts: With Anyone selected, users don’t have to be signed in to reply, or they can reply to this post by email. Trusted contacts: People you mark "Trusted" on your contact list. Recipients: People entered in the recipient field can see this. Accept All: All replies are displayed. Need Approval: Replies from other users are saved but they can only be visible when you approve them. Disabled: No replies are accepted. If you ever find yourself in advanced mode, click on Advanced permissions at the top to uncheck it and return to the quicker to use presets. A prompt may show up letting you know presets will reset permissions - simply click OK to return to presets and continue editing. Once you have finished typing in your post or uploading images or attachments, click on Post to save your post. By hovering the mouse over these details you can find out more information about the post including who and when it was posted, and its permissions. Permissions Icon: An icon displaying who can see this post. The icon used here is the same one selected in the permissions box during editing. Post Link: A link to the post’s page showing a shortened form of when the post was made. In the above example 3d 20h means 3 days and 20 hours ago. 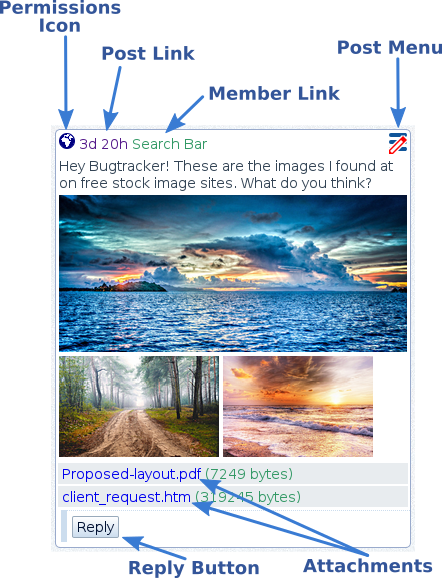 Member Link: A multipurpose link that can display information about the author of the post and how to contact them. Post Menu: A popup menu with the options to share, edit, or delete the post. 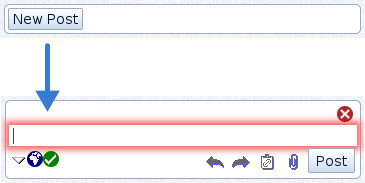 Only posts you can edit will have a "red pen" icon displayed. Reply Button: Starts a new post in reply to the above post. This is only shown if the post accepts replies. If a reply neeeds approval, a small clock icon will be displayed in the Reply button. A description of a post’s permissions can be found in the popup for the permission icon. After the permission icon is the post link which shows in detail when the post was made. Also, it is the link to the post’s own page. After the post link is the name of the author displayed as a member link. The popup for this shows a few options on how to contact them. At the bottom of the popup is the member’s handle and looks like an email address; this is what goes in the Recipients field in the permissions popup. View Profile: A link to the profile page of the member. Message: Opens a popup window to send a quick post (message) to the member. Add Contact: If you have signed in you can add this person to an address book on the side of the window. Trust: Add this member as a trusted contact to your address book. You will need to be signed in to also see this feature. Share: Send a copy of the post by email. In addition to the above menu item, posts you can edit will have a "red pen" in its post menu icon. 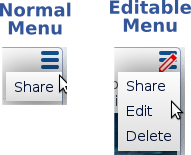 That way, you can quickly tell the difference between posts you can edit (Editable menu) and those you can’t (Normal menu). Edit: The post will become editable with the edit controls reappearing around the post. Delete: Delete the post and any photos or attachments saved with it. Deleting is immediate and permanent, so choose wisely when doing this! This concludes the quick start guide for now. And other upcoming features that are in development!